This Flourless chocolate cake recipe is ideal for special occasions. 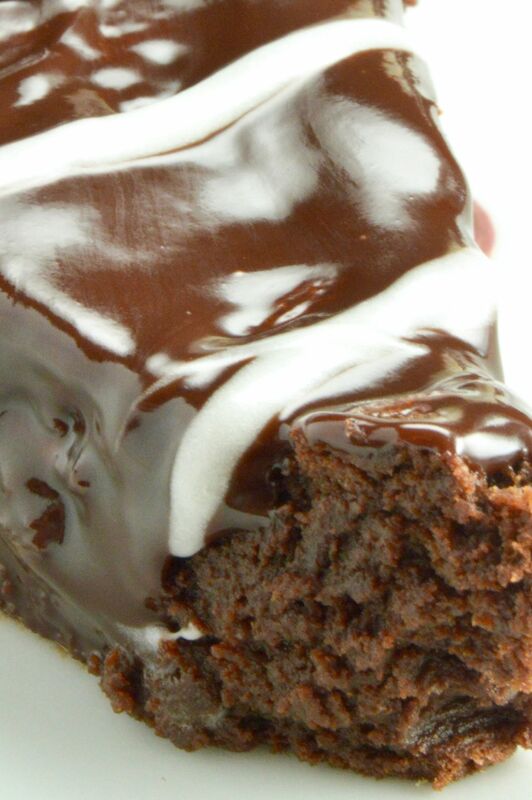 Its fudgy, gooey, chocolate lovers heaven in every bite. You can “fancy” it up with simple tricks to decorate the top too! This Flourless chocolate cake recipe has been a favorite every since I was served it by a really good friend of mine. I have lost and re-located the recipe numerous times over the years so often that I now have emailed several of my other close friends copies of this recipe so I don’t have to call my original source of the recipe ever again. The last time I called her for it I think she laughed for about 15 minutes about how for some reason I can’t keep track of it. In my defense, until I started this website, I wouldn’t really keep exact recipes… I would know what was in them and as I made them I would tinker until I knew it would be good. Also to note here thats not ideal for baking recipes…. but most things I make aren’t baking…… but then whats truly important is this Flourless chocolate cake recipe is delicious and you will come to love it as much as I do. I mean how could you not. Its dense, but not heavy because there is no flour. You can use your favorite chocolate, I use really deep dark chocolate, the cake is fudge like and moist. Then you add a glaze over the top that is gooey and shiny and makes you scrape every last bite off off the plate. This Flourless chocolate cake recipe is so easy although it does use a LOT of pans and bowls when you make it so be prepared. I usually have to do an entire load of dishes in my dishwasher when I make this. But once I have a bite of it….. I know it was worth it. The hardest part about making this Flourless Chocolate cake is folding in the egg whites. The step it critical to keeping the cake lighter. The Kitchn has a great video here to show you how to do that without any problems! I give you directions how to get the pretty white swirl in the picture of the Flourless Chocolate Cake but you can also just leave the cake as it is and serve it with a dollop of whipped cream or ice-cream. The cake would also look great with a few berries on the plate. You can make this cake a day ahead without any problem. Just store it in an airtight container so it doesn’t harden and dry out. Ive also placed it in the fridge covered, and just allowed it to come to room temp before serving. You could also have a nut coat on the edges if you wished. Just put them on while the glaze is still firming up. Looking for other things to use for a sweet tooth for a birthday party or something for a potluck? Please check out the other sweet treats you might enjoy… Million Calorie Bars Lemon Blueberry Muffins or this recipe for Blueberry Thyme Mini Tarts! 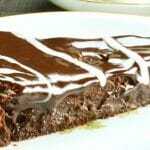 Flourless chocolate cake is ideal for special occasions. Its fudge, gooey, chocolate lovers heaven in every bite. You can "fancy" it up with simple tricks to decorate the top too! Butter 9” spring form pan. Line bottom of pan with waxed paper. Butter paper. Stir chocolate and butter in medium saucepan over low heat until melted and smooth. Remove from heat, cool to lukewarm, stirring often. Fold lukewarm mixture into yolk mixture. Then fold in vanilla. Fold whites into chocolate in 3 additions. Gently press down crusty top to make evenly thick cake. Using a knife, cut around pan sides to loosen cake. 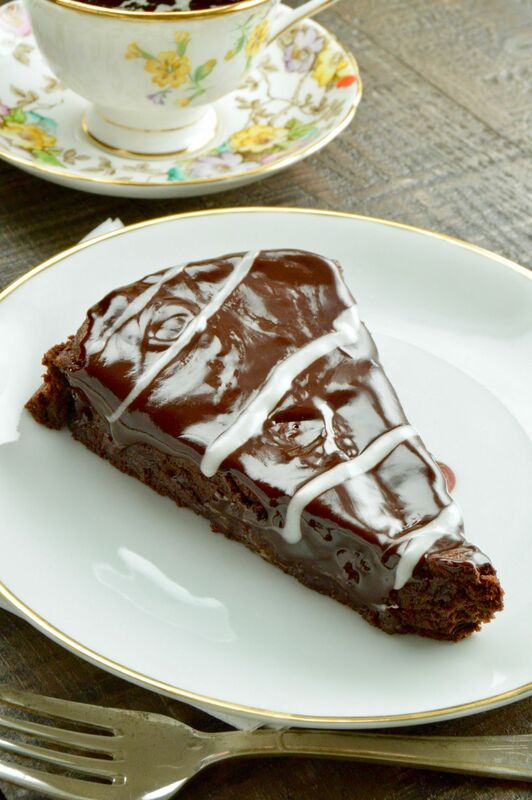 Place 9 “: tin, or plate on atop cake (or cardboard) Invert cake …peel off parchment. Place cake on baking sheet . Spread 1/2-cup glaze smoothly on top and sides. Freeze until almost set, about 3 minutes. Make glaze by adding melting chocolate and corn syrup until blended in a small sauce pan. Allow to cool for 5 mins, then spread 1/2-cup glaze smoothly on top and sides. Pour remaining glaze over top smooth sides and top. If making white squiggles as pictured you will mix whipping cream and powdered sugar in a bowl until blended, then place it in pastry bag or ( zip lock bag butting off a small tip) to pipe. Decorate as desired while second coat of glaze is still liquid. 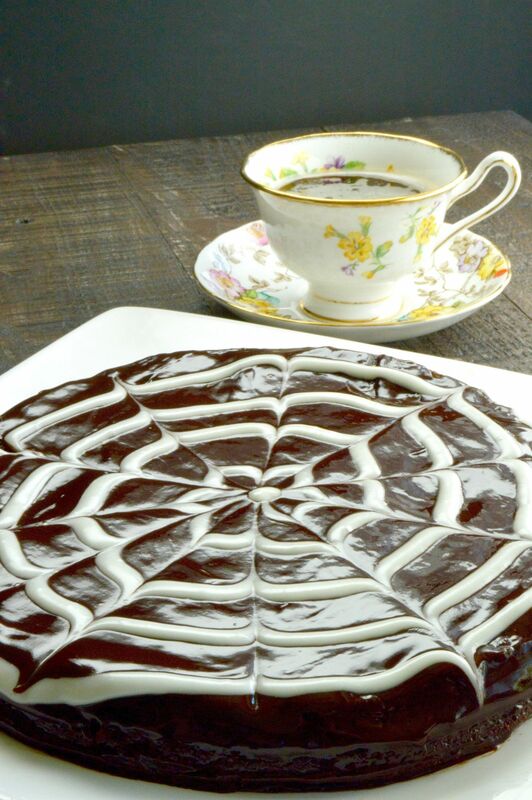 Place cake on platter and chill until the glaze is set, about an hour. Cover with dome and store at room temp. Garnish with shavings and serve at room temp. To make the design of the cake shown you will take 1/4 cup powdered sugar and 1/4 cup whipping cream and mix to get a frosting. Place in a piping bag or in a zip lock back and then cut the corner tip off to pipe out frosting. Starting at the center in one continuous circle pipe out a spiral going from small to large (about 1/4" apart each line ) until you have a spiral on the entire top of the cake. You want to do this immediately after placing the glaze on the cake so that you can then pull on the white frosting thru the chocolate glaze to get the design. You then use a tooth pick to draw from the center to the edge in equal distance. Once you have gone all the way around the cake you then come back and in between each line you have already drawn you go from the edge of the cake to the center. This will give you the squiggle effect and the small flower at the center. Flourless! I have to try it out 🙂 Have been substituting whole wheat with APF in regular recipe, but I am yet to try a flourless cake.. I first thought maybe you are using almond meal or some other substitute for flour.. but this really is flourless! I don’t think you can ever go wrong with a delicious chocolate cake! Rebecca! When you are right, you are RIGHT! :).